Transept and crossing tower of York Minster from the south east. The Great East Window: one of the largest expanses of mediaeval stained glass in the world. 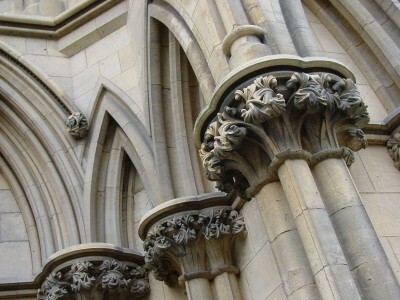 The west front of York Minster is a fine example of Decorated Gothic architecture, such as the elaborate tracery on the main window. This period saw detailed carving reach its peak, with elaborately carved windows and capitals, often with floral patterns. View over the houses, showing position of the Rose window. 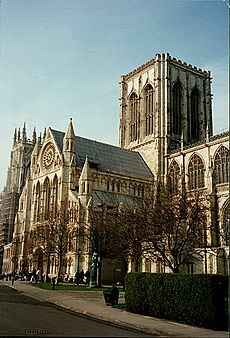 York Minster is the largest Gothic cathedral in Northern Europe. The title Minster is given to churches which in the Anglo-Saxon period were missionary teaching churches. 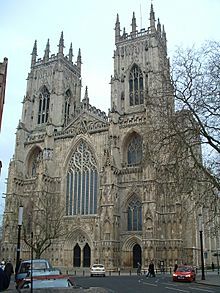 York Minster is in the city of York, Yorkshire, north-east England. It is the 'seat' of the Archbishop of York, the second-ranked religious official of the Church of England. The Minster is run by a Chapter (committee) under the Dean of York, who manages the affairs of the Minster. 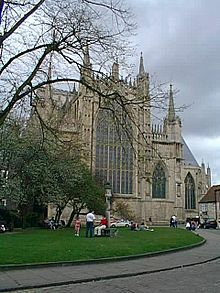 The architecture of the Minster is English Gothic architecture, from Early English in 1270 to Perpendicular in 1472. The Minster has a wide, Decorated Gothic nave (where the congregation sits) and Chapter house. The choir (spelled 'quire' by the church) is slightly later English Gothic architecture. The east end, and north and south transepts are in a similar style. The nave contains the West Window, constructed in 1338. Some of the stained glass in York Minster dates back to the twelfth century. Over the Lady Chapel in the east end is the Great East Window (finished in 1408), one of the largest areas of mediaeval stained glass in the world. 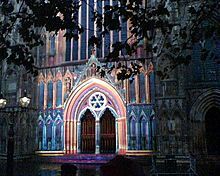 The window is known to be the work of John Thornton of Coventry a master glazier and stained glass artist who was active in England during the first half of the 15th century. In the north transept is the Five Sisters Window, each narrow window being over 16 metres (52 ft) high. The south transept contains the famous Rose window. About 2 million individual pieces of glass make up the cathedral's 128 stained glass windows. Much of the glass was removed before and pieced back together after the First and Second World Wars, and the windows are constantly being cleaned and restored to keep their beauty intact. A total of seven clock bells, 14 change ringing bells and 22 carillon bells are lodged in the towers. The carillon bells are played on a baton keyboard in the ringing chamber. The largest bell is Great Peter, which strikes the hour. It weighs 10.8 tons. York has had a Christian presence from the 300s. The first church on the site was a wooden structure built hurriedly in 627 to provide a place to baptise Edwin, King of Northumbria. A stone building was completed in 637, and was dedicated to Saint Peter. Its school and library were started in the 7th century. In 741 the church was destroyed in a fire. It was rebuilt as a bigger building, with thirty altars. The church and the entire area then passed through the hands of Norse invaders. The Benedictine archbishop Ealdred travelled to Westminster to crown William in 1066. Ealdred died in 1069 and was buried in the church. The church was damaged in 1069, but the first Norman archbishop, arriving in 1070, organised repairs. The Danes destroyed the church in 1075, but it was again rebuilt from 1080. Built in the Norman style, it was 111 m (364.173 ft) long. The new structure was damaged by fire in 1137 but was soon repaired. The choir and crypt were remodelled in 1154, and a new chapel was built, all in the Norman style. The Gothic style in cathedrals had arrived in the mid 12th century. Walter de Gray was made archbishop in 1215 and ordered the construction of a Gothic structure to compare with Canterbury; building began in 1220. The cathedral was declared complete and consecrated in 1472. The English Reformation led to the first Anglican archbishop. Some of the cathedral's treasures were taken by the Crown, and the church lost some of its land. Under Elizabeth I there was an effort to remove all traces of the Roman Catholic Church from the cathedral; there was much destruction of tombs, windows, and altars. In the English Civil War the city was besieged and fell to the forces of Cromwell in 1644, but Thomas Fairfax prevented any further damage to the cathedral. 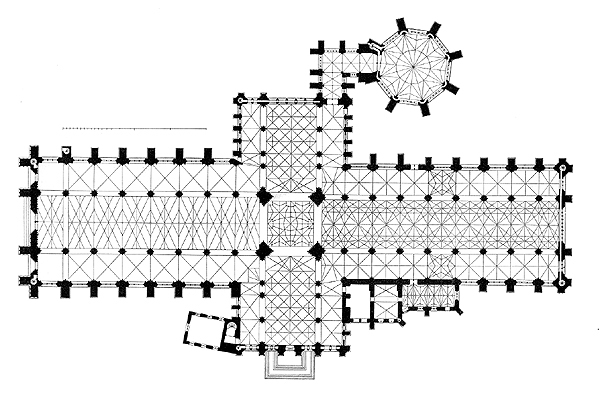 The cruciform plan of York Minster by Georg Dehio. The Kings Screen and organ. York Minster viewed from the South East. York Minster Facts for Kids. Kiddle Encyclopedia.